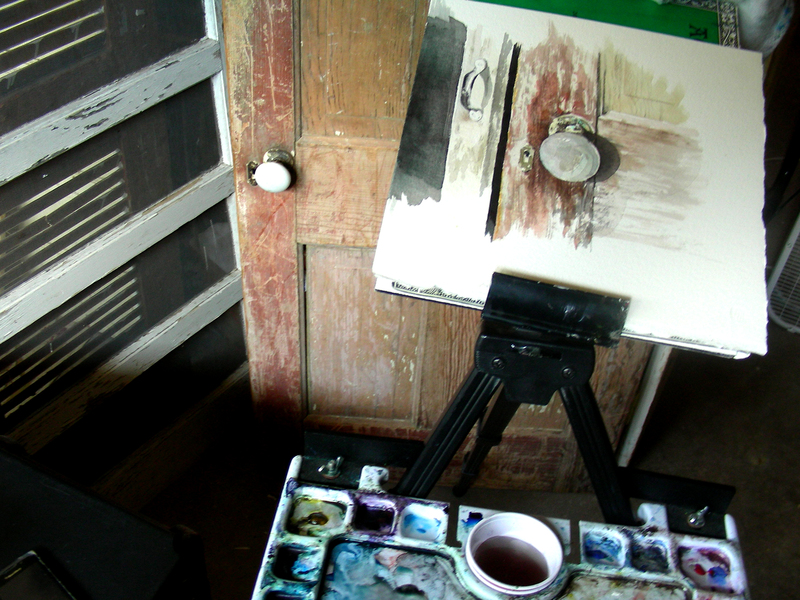 Ultimately, it doesn’t matter to the world if you paint or dance or write. The world can probably get by without the product of your efforts. But that is not the point. The point is what the inner process of following your creative impulses will do, to you. It is clearly about process. Love the work, love the process. our fascination will pull our attention forward. I could not agree more strongly with Mr. Roberts on this point. I get far more joy in the studio, in the midst of a painting in progress, than I do sitting back looking at it on display, or sitting in a festival booth, waiting to find out if patrons like the work or not. The joy is in the doing. Today, I took my Art History classes through the legacy of Andrew Wyeth and his drybrush watercolor studies from Chadds Ford, Pennsylvania. And the whole time we looked at and discussed his work, all I wanted was to be in this Cave proceeding with my latest “mad” experiment. But alas, I had a list longer than my arm, of details I had to chase down after school, and heavy lesson plans for tomorrow’s class load, and couldn’t get into the studio for nearly five hours since the close of my last class. It was total despair. 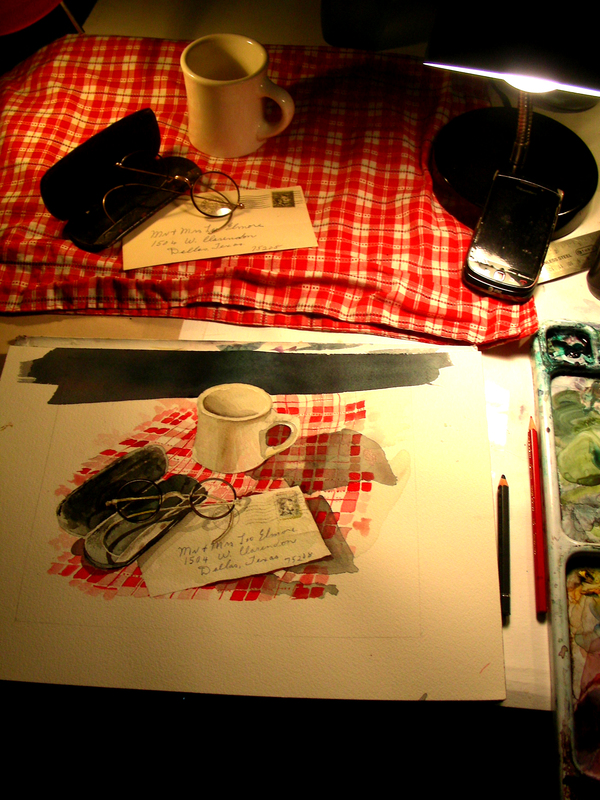 Finally, I got to get in a few strokes, working only on the coffee can and the left border of the composition. The door frame will be white, so I had to lay in a left-hand darkened border. I’m already wishing I could remove the masquing and take a peek at what is happening, but that cannot happen for a long time still. My only anxiety now is to get this looking the way I really like it, only to find a disaster when the masquing comes off. But . . . I cannot think of that right now. I am still a little tired from Saturday and Sunday’s output, but really feared that if I took a little time off to rest, that I would find myself already into the next weekend, that a day off would turn into a week off, and the momentum would have stalled. Several years back, I attended a workshop led by J. Jason Horejs, owner of Xanadu Gallery in Scottsdale, Arizona. He had just flown into DFW airport and was holding a session at an area hotel in Dallas. The session, for me, turned out to be life changing. The only question he had for the artists assembled that day was “How prolific are you?” I sat there in shame, realizing that I had used my full-time job as an excuse for turning out an average of ten watercolors a year. I left that class, determined by year’s end to have at least thirty completed. I completed nearly a hundred, and have completed at least a hundred a year since then, though many of them are small watercolor “sketches” or “vignettes”, I nevertheless can say for the first time in my life that I am “prolific” as an artist, and thanks to the blog, feel a compulsion to keep cranking them out. So many good things have happened as a result, but the greatest is that I have rediscovered a joy in the learning process that I had not known for years. The picture was no longer supposed to be Beautiful, but True–an accurate representation or equivalence of the artist’s interior sensation and experience. If this meant that a painting had to look vulgar, battered, and clumsy–so much the better. Two weeks ago, when I purchased my antique screen door, I immediately knew that I wanted to try painting the screen with an object visible in the gloom behind it. Then I took my temperature, fearing I was crazy. But I couldn’t stop thinking about it. Yesterday I posted my first experiment in masquing the screen-wire pattern on a small portion of my screen door to see if I could capture a screen door appearance on my watercolor. 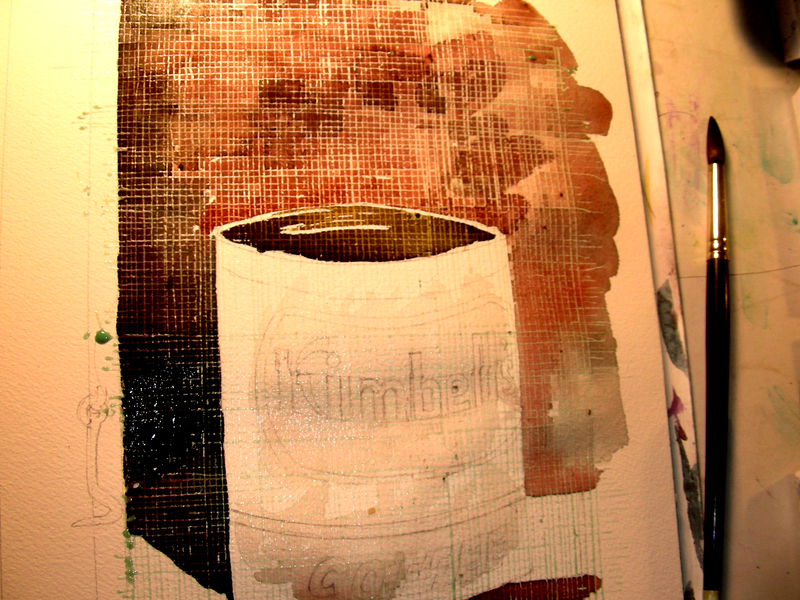 I was satisfied enough with the effect to take this next step–painting a Kimbell’s Coffee can behind the screen. It took awhile for me to adjust the doors and lighting to get the gloom I was seeking in the composition. 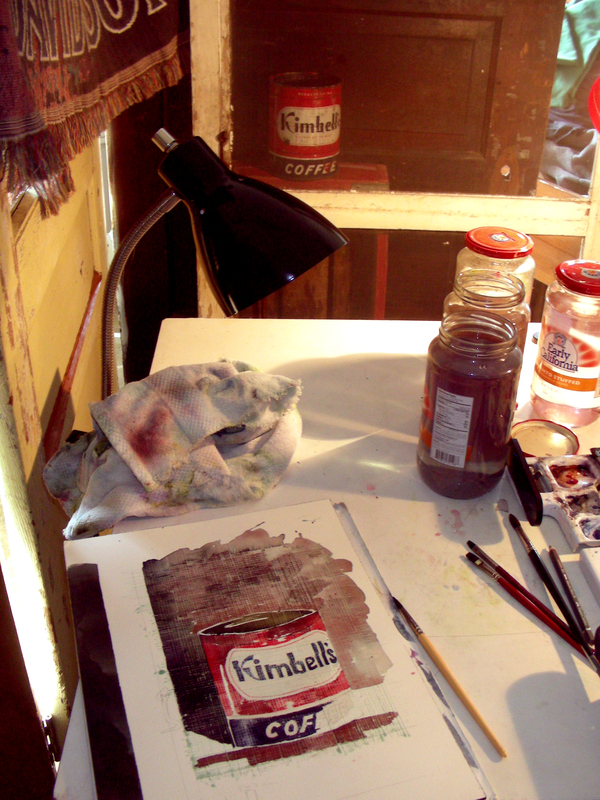 Then I had to draft the screen door frame and draw the Kimbell’s can with all the lettering in place as best as I could. Then came the tedious task of taking the Masquepen Supernib, placing a ruler on a couple of books, one-half inch above the surface, and zipping the pen along, squirting out the fluid in parallel ruled lines all the way across the composition. After letting it have plenty of time to set up and dry, I then had to repeat the process with the series of 90-degree cross lines. This took a considerable amount of time out of my afternoon. Once all of it was dry, I then began to flood the entire screen area with washes of Winsor Violet, Transparent Yellow, Cadmium Red and Phthalo Turquoise. Now the painting is very wet and soupy, and since it is on a block, there is no place for the water to go, so the lake is going to have to sit quite awhile before it is dry enough for me to proceed. Feeling the role of the mad scientist, I have to acknowledge that this experiment might fail. I have a notion of what I’m going to do, and think my strategy is sound. But I’ve never tried it before. So it’s going to be exciting watching in the days ahead to see if this is going to work. If not, then it will be back to the drawing board. 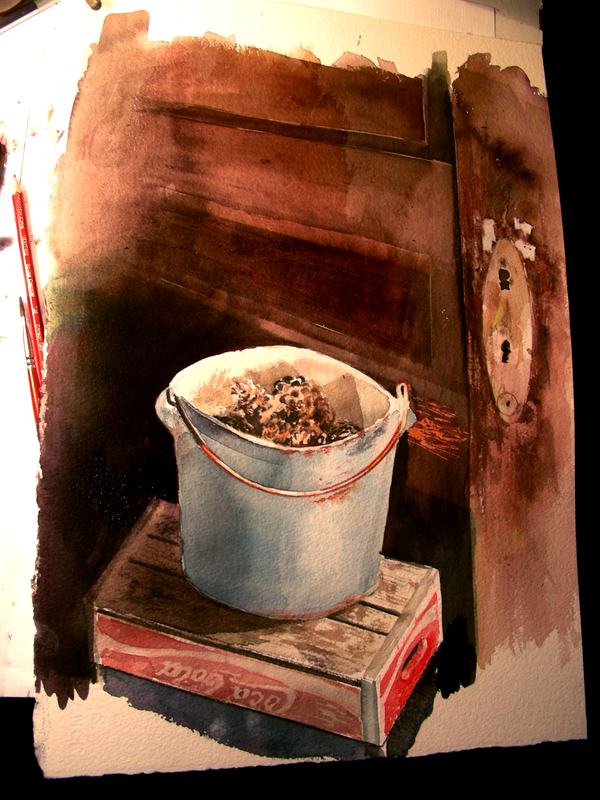 Because I have decided that I do indeed wish to develop a technique of watercoloring dim, dark interiors with dramatic lighting the way Andrew Wyeth did. And the screen door is such a profound part of my childhood memories that I really want to work it into some future paintings. We’ll see how it goes. I perhaps owe an apology to my subscribers for “clogging the blog” today. I have been annoyed in times past by someone posting dozens of blogs in the same day, and my BlackBerry going off all the time with each new announcement. I try not to make a practice of this. 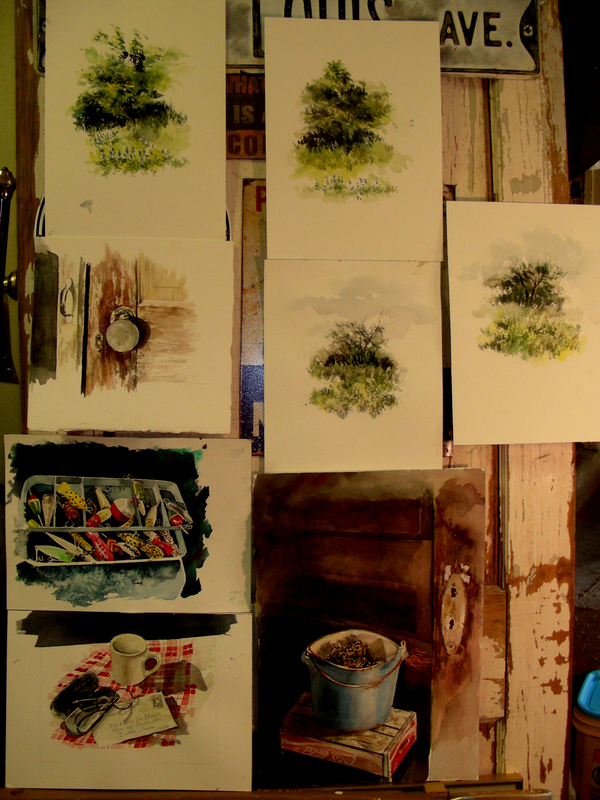 Nevertheless, I wanted to post a picture of one of my doors in the man cave covered with what happened over the past eight days, beginning with a Saturday plein air excursion in Ennis, Texas, and culminating in today’s activity, closing out a series of watercolors in the Man Cave. I feel a measure of satisfaction that I can look at the week’s output and say I have accomplished something in addition to showing up for school everyday to monitor TAKS testing and teach truncated classes in the afternoon. I can now look back over it all and say it has been a good week. Thanks for reading. This should do it for today! Great painting is like Bach’s music, in texture closely woven, subdued like early tapestries, no emphasis, no climaxes, no beginnings or endings, merely resumptions and transitions, a design so sustained that there is no effort in starting and every casual statement is equally great. As I bring today’s “cave activities” to a close, I feel a touch of sadness. 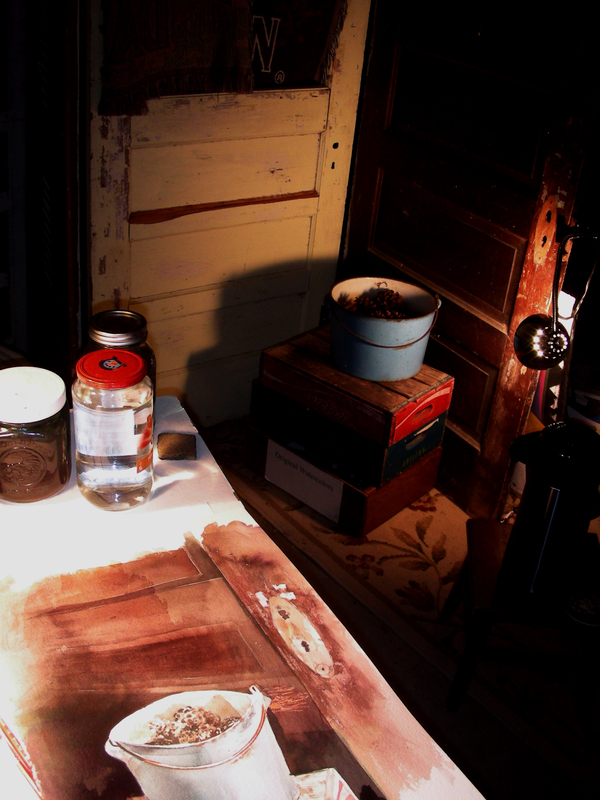 I’ve been playing and replaying a DVD of Andrew Wyeth’s work: Self-Portrait: Snow Hill. I still remember January 16, 2009, the day I stood at my school computer, and saw on the day’s news that Andrew Wyeth had passed away. It was not unexpected, he was aged and in poor health. I had known that. But my eyes filled with tears, as they still do when I listen to this DVD play, and realize that there will be no more work coming from his hand. 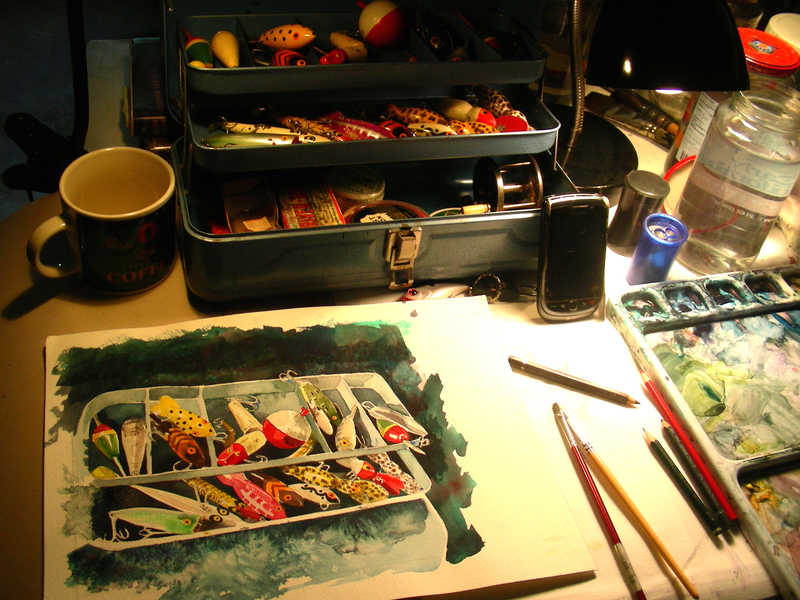 He has been the life-force of my art throughout most of my life, and yet I didn’t venture into a drybrush still life until four years after his passing. Now, I cannot seem to let it go, I am so absorbed in the dynamics that play when eyeing an object in light and shadow, and trying to reproduce it on a white rectangle before me. This has been quite an explosive day in the Man Cave. 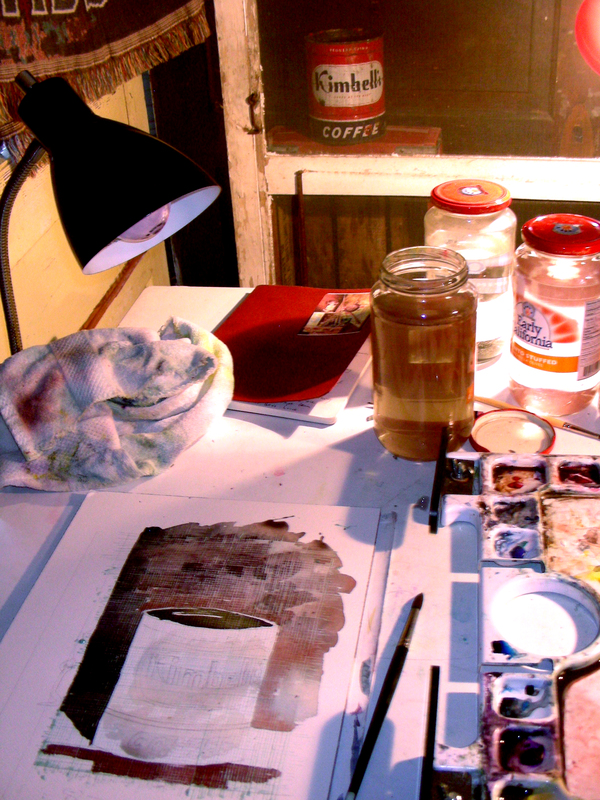 I’m not used to plowing through so many watercolors, attempting to bring them to conclusions. But it’s been quite a ride, and I’m glad I did it. Tomorrow starts another weary round of school, and it is time to change gears, to pay my dues. Thanks for reading. And thanks especially to all of you who have been following me throughout this day, posting your “likes” and “comments”. I appreciate every encouraging word and gesture. 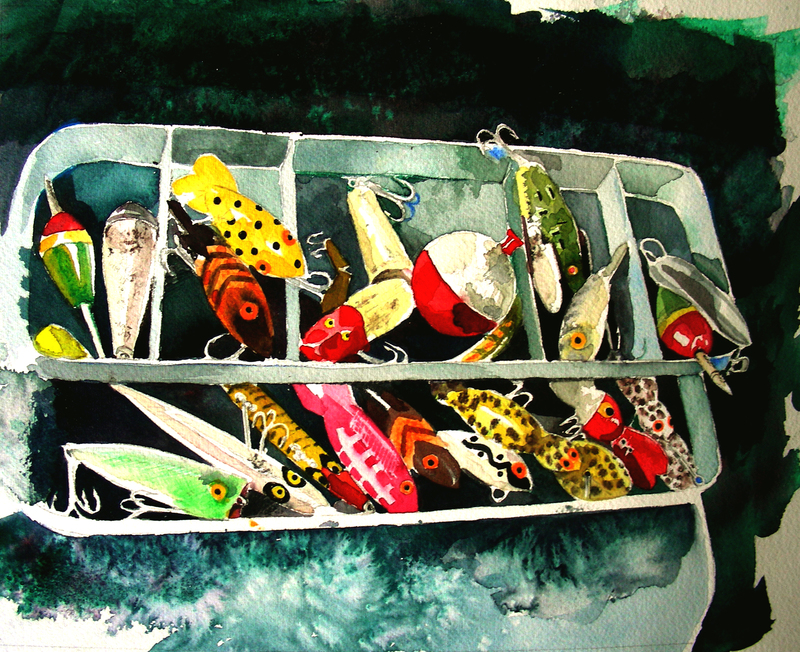 The day continues to flow smoothly, and I’m happy to be clearing out some watercolors that were beginning to stack up. This one I started several weeks ago and really enjoyed picking at. There wasn’t much left to do today, but clean up a few small details and try to heighten some of the contrasts here and there. Time to move on to the next one now. I think Kerry Cash is one of the greatest, if not THE greatest, luthiers in all of north Texas. I have taken guitars to him a number of times for him to work on, and noticed that he would easily have more than fifty guitars arranged around the shop, with work tickets, waiting their turn. My father, a retired auto mechanic, said that was how you could always tell a good and trustworthy independent mechanic with his own shop–if you saw his entire lot filled with vehicles waiting their turn. People were willing to wait, knowing the mechanic was excellent and honest. What always surprised me about Kerry, is that he would take my guitar, tell me he had 50-75 guitars in the shop already, and it could be a couple of weeks before I would hear from him. Yet, I would always get his phone call in two-to-four days. One day I asked him how he did this, and his response was that, when the guitars stacked deeply as to 50-75, he would dedicate a particular day to “cleaning up” by moving to the top of the list all the “small jobs” that didn’t take long to complete. By day’s end, he was delighted to have more than twenty guitars leaving the shop. That is how I feel about the watercolors that have been stacking up the past week-and-a-half. I’m ready to start cleaning some of them out. 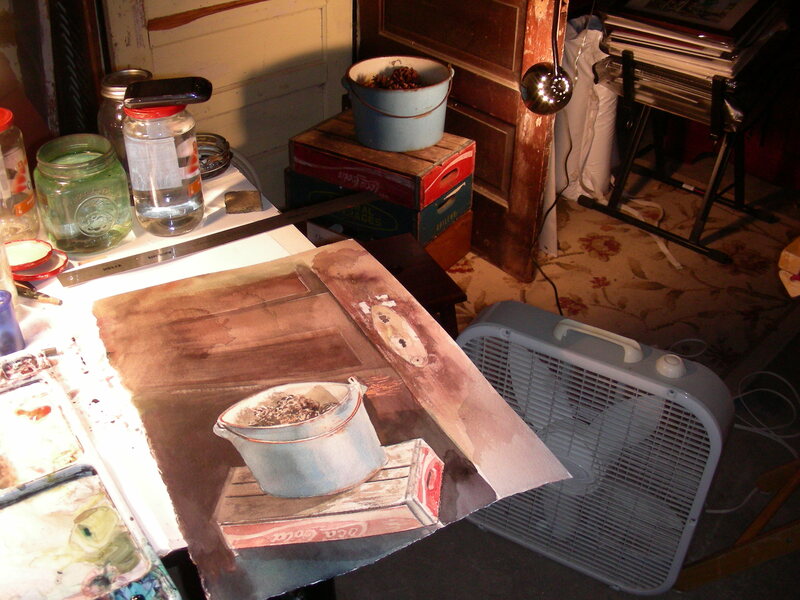 Hence my blue pail and my cafe still-lifes. On this cafe piece, I’ve been working all over on the table cloth, pushing it more around the perimeter of the composition, extending the pattern in all directions. I’ve also tweaked the shadows and definitions on the spectacles case. I think I am very near finishing it as well, and will lay it aside for now. I have titled this blog entry “Musing About Andy Warhol’s Factory,” because I have loved for over ten years every story I could read about Warhol’s Factory before his 1968 tragedy. I was always amazed at his output, his energy, and the way he kept so many art projects going at the same time, and kept cranking them out, as though on an assembly line. Ever since I have set up this garage studio, this Man Cave, I have laughed at it being my Factory, without the parties, the company, the drugs, the rock music, all the craziness with which Warhol kept himself surrounded during those wild years. My Factory is quiet, especially at night, and even now during this Sunday. And I’m glad to be finishing up some work. Well, staying up in the Man Cave till 1:30 a.m. meant sleeping in this morning. Once I emerged from my sleep and re-entered the Cave, I liked, for the most part, what I saw of this late-night painting. 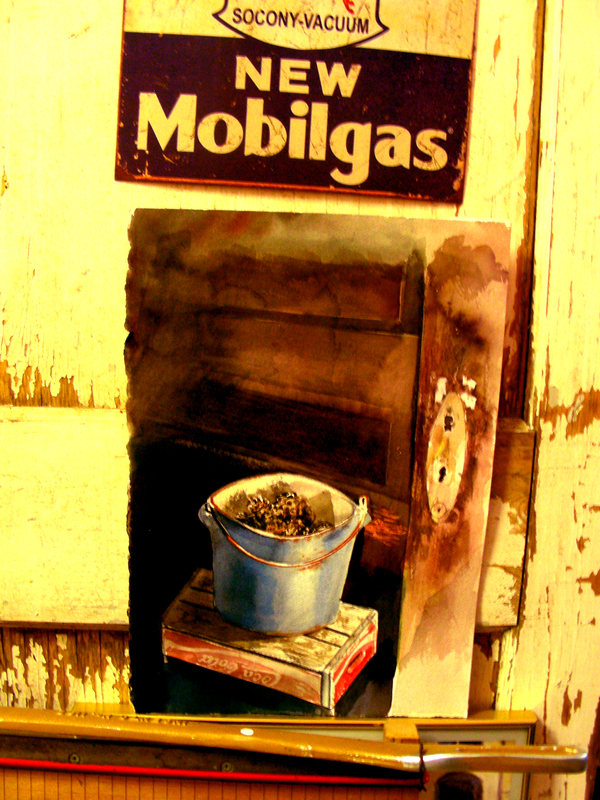 I’ve decided to set it aside for awhile, propping it against one of the other old doors in my Cave. I have three other in-progress watercolors clearing their throats, trying to get my attention. So, I guess I’ll return to them, and look up from time to time at this one, and decide whether it’s complete, or needs further work. I call this “composting” as I let the painting sit dormant for awhile, and give my mind some time to ingest it and make decisions on what to do next. On to the other paintings, then. Thanks for reading. I could not possibly have dialed up a more perfect Saturday night in the Man Cave. I had the exquisite privilege of engaging in plein air painting with a host of friends earlier today in a perfect prairie environment. Coming home exhausted, I chose to close my eyes for a short period in the late afternoon. Now, with coffee in the man cave, I had planned on working on this piece until the wee hours of the morning. But suddenly, it “looked” finished. I know it’s close. I’ll wait until I can see it tomorrow under natural light, and will no doubt have some “tweaking” to do. But it is nearly complete, and I’m surprised. I only started it this week. I noted with disgust that my door looked twisted because I had badly drawn one of the recessed panels out of perspective. Some re-drawing and sandpaper was called for, but it didn’t take long to fix that. I then reworked some of the wood of the crate, intensified the blues on the pail, completed the ring around the top of the pail, refined the pine cones a little more, deepening the contrast. Finally, I added more washes to the door to darken it further, and then decided to finish out the borders on all four sides, extending the paint all the way to the edge. There was plenty of mopping up to do tonight, but it went really fast. My studio tonight has entered a time warp. (For those readers only interested in my painting observations, you can stop reading at this point.) But I really want to share this eccentricity that is turning out to be so enjoyable this evening: Back in 1987, I taught as an adjunct instructor at Texas Christian University, and dispatched for the campus police department in the evenings, getting off at midnight. The dispatcher who relieved me (Archie) was an interesting dude, always coming in at 11:55 wearing army fatigues, sporting a military haircut, carrying his sketchbook and tacklebox full of art supplies (he was an art major), and chewing gum. The first thing he did was walk over to the boom box and tune in to an FM radio station, KZPS 92.5. The program was “Enerjazz at Night.” It ran 8:00 p.m. till 2:00 a.m. He then went into the kitchen to make strong coffee to keep him going till 8:00 a.m. Those 5-10 minutes in his space every night during the shift transition were enough to get me addicted to jazz music, especially when making art late at night. At my apartment, I had an enormous stack of blank 90-minute cassettes given to me by a disc jockey from an FM station years before. I started bringing them with me at night, and as soon as 8:00 p.m. rolled around, I popped a cassette into the boom box and recorded “Enerjazz at Night.” So, I now have hours and hours of FM programming from the winter of 1987, with the DJ calling out the wrong times, the wrong temperatures, concerts at local venues that no longer exist. And I just get a kick out of listening to this stuff while I paint alone into the night. It brings back some of those memories of late nights in the 1980’s when I had not yet started teaching in the public schools, dispatched for the police at night, and often went home to my apartment at midnight and resumed an art project that had been waiting for me. Thanks for indulging me. I just had to get that off my chest. Now, that I’ve stopped this painting, and am not yet sleepy, I suppose I’ll sink into a comfy chair in my man cave, continue listening to the jazz (all of it instrumental) and re-open one of my many unfinished books. It’s time to enjoy the late night. For the second consecutive weekend, I had the privilege of gathering with my plein air painting friends. We met at the Tandy Hills Park in east Fort Worth and participated in Prairie Fest, a Green festival that draws a wonderful crowd of environmentally-friendly people, the best kind. The live music was spectacular, and a number of us found a wonderful patch of wild prairie land on the east side of the park, away from all the festival booths. 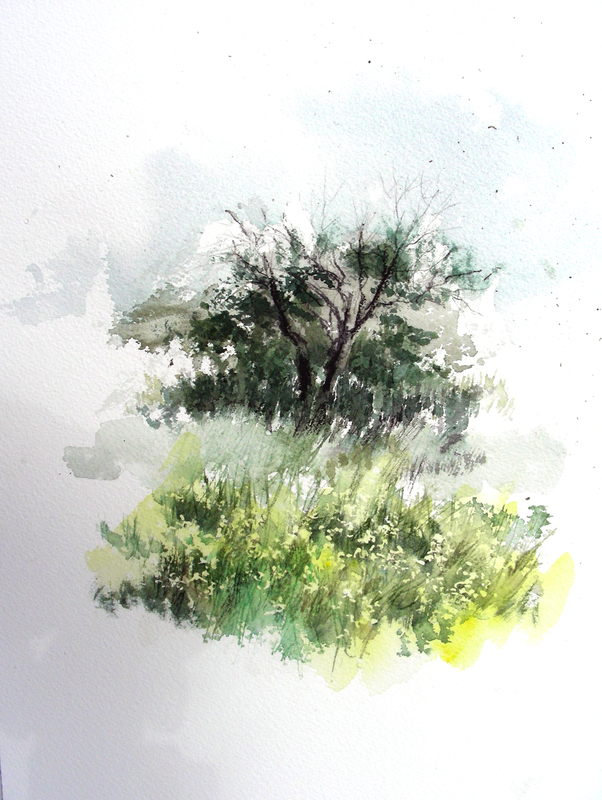 I took two shots at the same spot, a stand of trees with natural grasses and flowers in the foreground. I enjoyed my experiments in masquing and salting, as well as working with water-soluble graphite pencils and watercolor pencils, in addition to my Winsor & Newton pigments. The skies remained overcast most of the time, so the quality of light was not the greatest. But the cool breezes were certainly welcome, and it would not have been much fun for sun-sensitive me to stand out on an open prairie around noon with the sun beating down on me. I’m glad to be back home this afternoon. I’m a little tired from the morning excursion, and feel that I may have to wait until this evening to get back to work in the studio. I have several pieces I would love to finish, but feel some fatigue setting in right now. If a painting is good, it will be mostly memory. I spent much of this evening, listening to Andrew Wyeth documentaries on VHS and DVD, as the shadows gathered in the Man Cave. As I look at Wyeth’s drybrush and watercolor sketches, I am mesmerized at his dark, dim interiors. 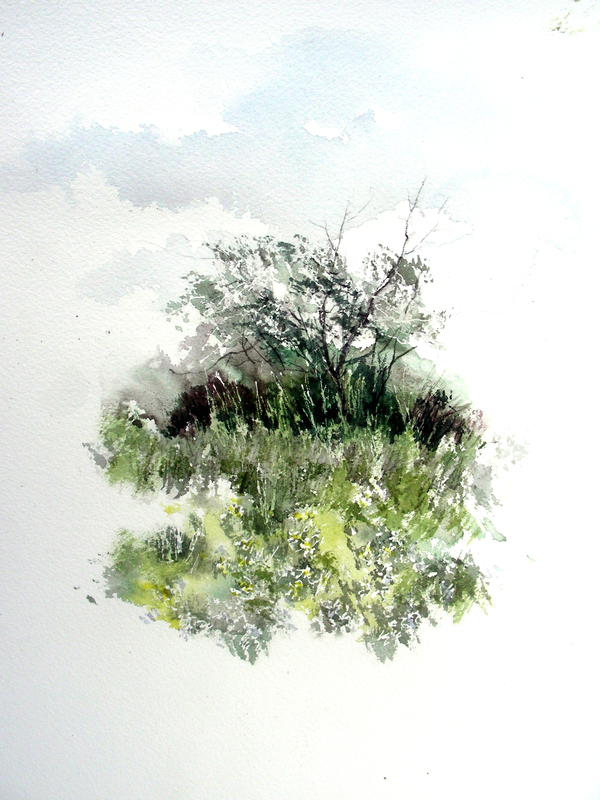 The D’Arches paper I use makes me think I am painting on snow–it is so white and reflective. 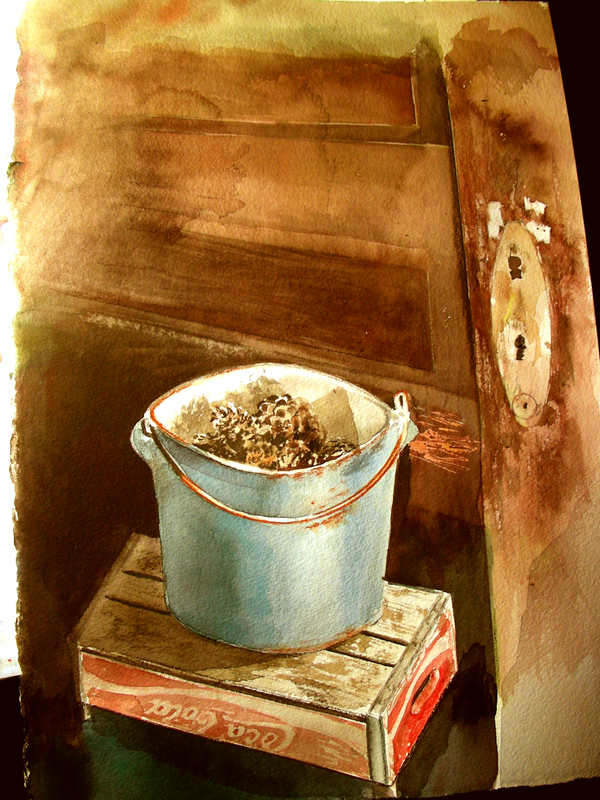 I apply countless glazes of pigment, trying to darken the areas around this pale blue bucket and capture the essence of the dim interior of a garage, work shed or barn. One of these days, perhaps I’ll figure it out. I did enjoy “scarifying” the door in the background. 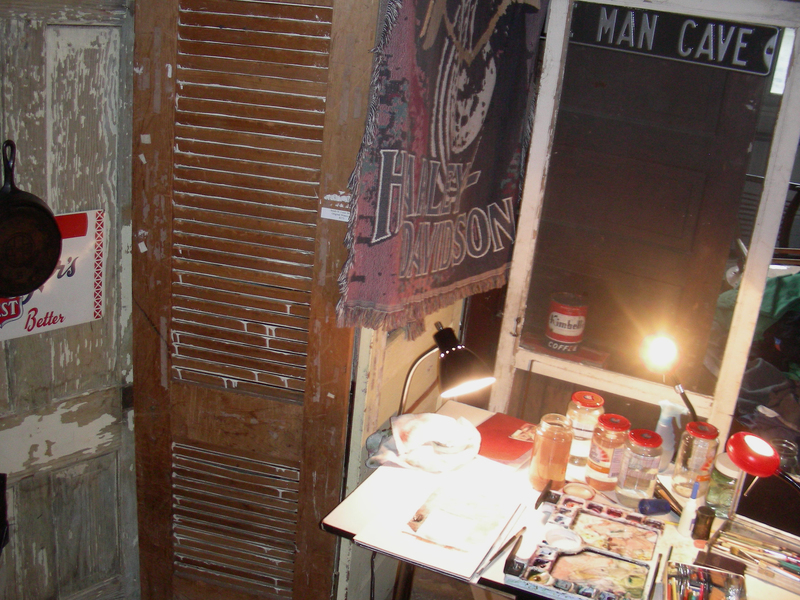 My Man Cave has nine aged doors that I keep moving around and studying for their varying textures and colors. I really want to master abused wood textures and colors in watercolor. This has been a fascinating study for me. 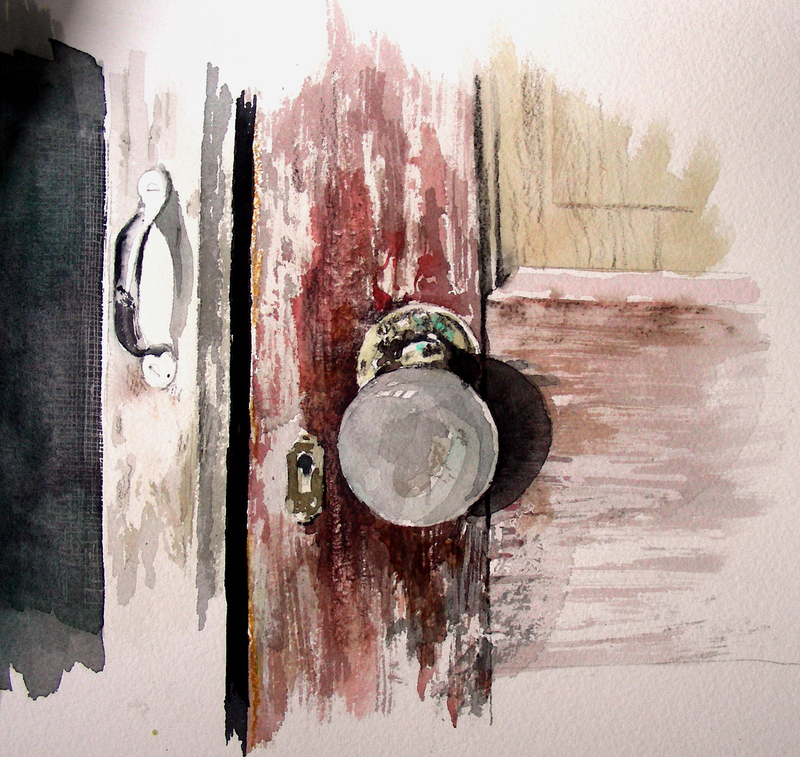 I have combined watercolor, x-acto knife scrapes, colored pencil, watercolor pencil, graphite and fingerprints to build up layers of door grime. I just love getting into this. I’m still not sure how to get the blue pail to “pop.” The blues I have been pouring on it have not really worked to my liking, yet. I have worked transparently, layering wash after wash. There is still plenty of paper surface shining up through the layers of pigment, but I’m still not getting the luminosity I want. I’m not sure how to solve this issue yet. The overturned Coca-Cola crate has surprised me. I’ve barely touched it, and I feel that it is about “there”, if not “there” already. I had this same issue twice before when painting a cast-iron skillet in my two large still-lifes back in January. The skillet only required minimal work and was done. I was disappointed! I wanted to work it, re-work it, and re-work it, applying layers and textures, and building up pigments, but it seemed to shape itself rather quickly. That is what has happened to the Coca-Cola crate–I had all kinds of plans for it, and it looked “finished” before I even got into it. Oh well. Maybe the next time it will be more obdurate. Well, it’s getting late. 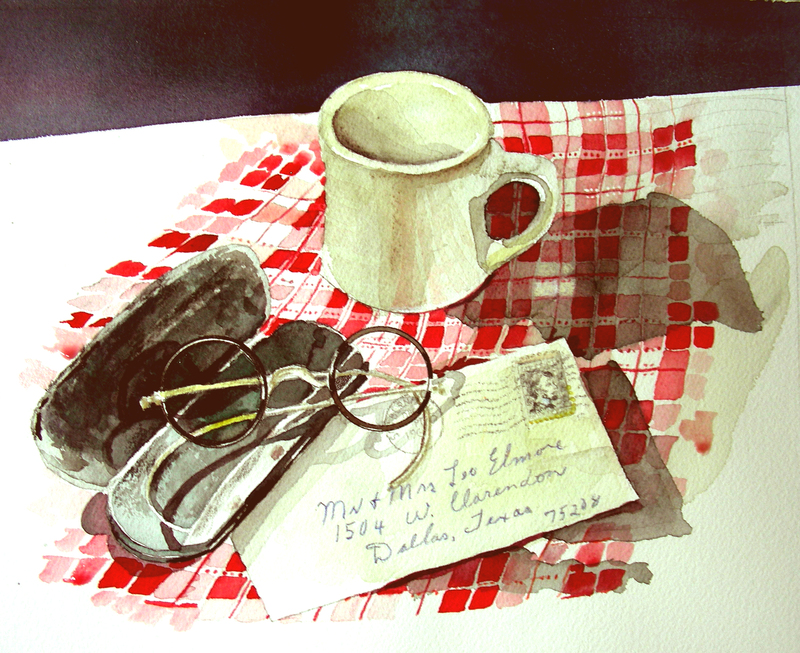 I have a plein air invitation pending for tomorrow, and I’m seriously considering participating in the event. So I guess I’ll turn out the lights and give this painting a rest. Tomorrow in the daylight I can see if I like what’s happening.